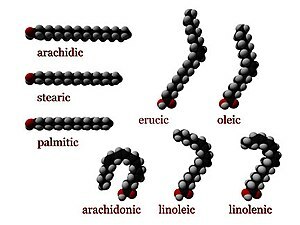 ^ IUPAC Compendium of Chemical Terminology 2nd. International Union of Pure and Applied Chemistry. 1997 [2007-10-31]. ISBN 052151150X. ^ Alberto Ascherio, Eric B Rirnm, Edward L Giovannucci, Donna Spiegelman, Meir Stampfer, Walter C Willett. 1996.Dietary fat and risk of coronary heart disease in men- cohort follow up study in the United States.British Medical Journal. 313(7049): 84-90. ^ Dariush Mozaffarian, Eric B. Rimm, David M. Herrington. 2004.Dietary fats, carbohydrate, and progression of coronary atherosclerosis in postmenopausal women. The American Journal of Clinical Nutrition. 80(5): 1175–1184. ^ Matthew W Gillman, L. Adrienne Cupples, Barbara E. Millen, R. Curtis Ellison, Philip A. Wolf. 1997 Inverse association of dietary fat with development of ischemic stroke in men.The Journal of the American Medical Association. 278(24): 2145–2150.